Protesters en route to Umdoni Municipality. SOURCE: South Coast Herald. Protesters have highlighted the need for officials to shift their priorities from squabbles over who holds the most power to resolving urgent issues such as employment. Protest action has been reported as protesters made their way towards Scottburgh from Amandawe, in KwaZulu-Natal, on Wednesday morning. Protesters moments ago peacefully marched through Scott Street as they made their way towards Umdoni Municipality, demanding that Mayor Thabani Dube hear them out, the South Coast Herald reports. Police are monitoring the situation closely, but the protest march in Scottburgh has been peaceful so far. Within five minutes since arriving at the municipality, protesters were greeted by Mayor Dube, who stood down from the monthly council meeting. Previously, Anti-Deployment Association members had disrupted a monthly Umdoni council meeting, demanding to be heard. Protesters highlighted at the time that Umdoni officials needed to shift their priorities from squabbles over who holds the most power to resolving urgent issues such as a lack of employment. 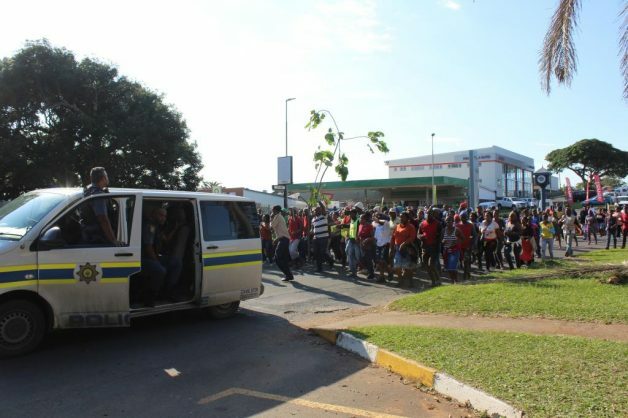 The march, led by the Anti-Deployment Association, was expected to come to an end at the Mpambanyoni riverside near the entrance to the Scottburgh central business district this morning. Road users are advised to make use of the N2 access point at Park Rynie should they wish to travel north. Umdoni Protection Services have blocked traffic from accessing the Dududu main road, which also grants access to the N2. Motorists are advised to exercise caution and rather avoid the area near the Mpambanyoni bridge and riverside. It has as yet not been verified whether the protesters will march along Scott Street. The protesters’ handed over a memorandum that contains a further list of demands set out to Umdoni Municipality’s leadership on behalf of the communities of wards 14, 16 and 17. Immediate suspension or resignation of three allegedly corrupt managers as per a report from cooperative governance and traditional affairs as well as findings submitted by the Auditor-General. Answers regarding the process of Gqolweni Road and why it has been delayed. Umdoni must implement an annual youth empowerment programme for unemployed youth and graduates with a budget of R3 million per year. Answers regarding the posts for 50 general workers as advertised and whether people were employed or not – if employed, what was the criteria for shortlisting. Further demands were made that Umdoni, when job opportunities become available, first prioritise local people. all youth who have undergone training by the municipality in terms of specialised and scarce skills programmes must be ‘exhausted’ by the municipality permanently. Managers must be obliged to sign a performance agreement which will allow leadership to dismiss incompetent managers with immediate effect. Demands were made that all meetings called for by councillors belonging to the respective wards above, only be held on weekends. Demands that the demarcation board revisit the demarcation of wards 14 and 16 since these have create mass confusion to the people of Amandawe and Amahlongwa. Councillors are warned to stop interfering – in respect of graduates – on internship programmes which are meant to benefit successful graduates in order for them to acquire minimum experience for the work environment. Demand that all construction companies with ties to Umdoni, or, contracted by Umdoni to render services on behalf of the municipality, to pay workers a minimum of R200 a day. The community have voiced that they expect all of the above issues to be concluded within a period of 10 days.